A misappropriation of victims funds took place in grand proportion on December 12, 2017. A simple hearing took place before Judge Sheri Bluebond where no more than one lawyer is needed. So how many did the Thorpe Insulation and J.T. Thorpe Settlement Trusts send? – 10 Lawyers! Yes – 10 lawyers were sent by the Thorpe Insulation and the J.T. Thorpe, Inc. Settlement Trust for a 15 min hearing!! A gross misappropriation of funds by a pack of frauds. 7 in Courtroom – 3 on the telephone. The Thorpe Trusts needed one lawyer – they sent 10! Victims – do you want to know where Trust money is going? In these lawyers pockets. Sham artists, frauds and perjurers. It’s no surprise that the rules of the Trust (which these same frauds adopted) allow EACH to bill at least $5,000.00 per day for “Trust Tasks”. No doubt each is billing for at least 2 days – plus hourly billing, plus travel, plus review, plus preparation, plus meals (and you can see they eat a ‘ton’)….total loss to Thorpe Beneficiaries – at least $200,000 – at least!!! All to further Trust fraud and a bad faith case against my office!! 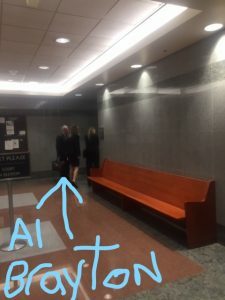 Note – there was a tentative ruling requiring further Briefing at the Hearing – 12/12/17. None of these ‘clowns’ needed to show up, except one. This relates to a lawsuit filed against my office solely to further Trust Corruption, Fraud and Bad Faith of Alan Brayton, Steven Snyder, Gary Fergus, Steven Kazan. By fraudulently attacking me and my office, Brayton and Kazan are harming thousands and thousands of Asbestos Trust victims — solely to protect the Trust funds for their own pockets. Al Brayton touts himself as a “Lawyer for the People” – this is a lie. Brayton breaches his Fiduciary Duty by supporting the Trust in their sham lawsuit against my office. Brayton, if he were truly for the (present) victims – would have never collaborated with the Trust in their sham attack on my office — which has now wasted over $5,000,000 of beneficiary funds (to losers like Snyder and Fergus) and harmed thousands of Trust victims. Brayton ONLY wants victims to be compensated….if they are represented by him.